"The new journalism specialties". 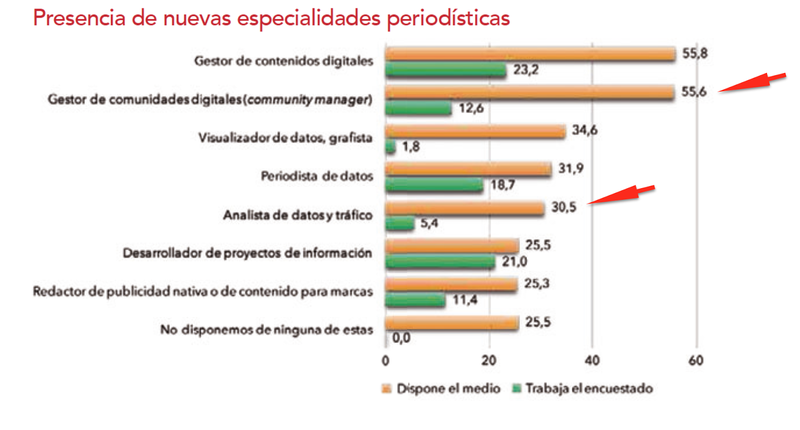 The graphic shows that 56% of the Spanish journalists surveyed work in media that have community managers, and 30% employ data and traffic analysts. Click to enlarge the graphic. Where will the jobs be for graduates in journalism and communication? The results of a survey of journalists in Spain give some indication. The urgent demand is for people with digital media skills, but more on that in a minute. The Press Association of Madrid's (abbreviated to APM in Spanish) 2017 survey was sent to 13,500 professionals, and the overall response rate was a respectable 13%. A little more than a third were working in journalism while another third were working in other professions or were retired or semi-retired. The remaining 30 percent were working in communications, mainly advertising and public relations. (News articles about the survey are here, here, and here in Spanish. The survey results show that the respondents to the survey are not the ones who are filling the new digital media jobs in their newsrooms. For example, 56% of the respondents said their publications had digital community managers--the people responsible for interacting with users in social networks and other channels--while only 13% of the respondents said they were working in those jobs. This might suggest that media organizations are filling these positions with people who are coming from outside their own newsrooms. Another possible explanation is that the people being hired for these new digital media jobs are newcomers to the profession and thus not members of the professional organizations contacted for the survey. 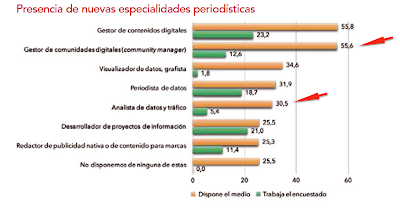 In any case, the same discrepancy shows up in several other digital specialties: 35% of the respondents' newsrooms have data visualization specialists, but only 3% of the respondents are working in those jobs. Similar discrepancies exist for data journalists (32% vs. 19%) and analysts of traffic and data (31% vs. 5%). This last one of traffic analyst is critical. It seems to indicate that newsrooms don't have people on board who know how to interpret the data about how the public is interacting with their content. Failure to understand the audience in today's highly competitive environment has fatal consequences. The APM's report, which runs to more than 100 pages, noted that there were 22,000 students enrolled in university programs of journalism and communication. In 2016, Spain's universities granted degrees in journalism to 3,400 students. Where will they find work? 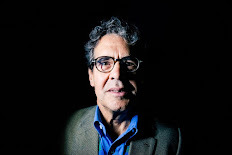 There were only 27,000 people working in radio, television, newspapers, and magazines, and many of these organizations have been ruthlessly cutting staff and salaries. That's the bad news. The good news is that traditional newsrooms are hiring more people with digital media skills, and the number of people working for digital-only media is growing. More than a third (36%) of the survey respondents were working in digital media or social media roles. they can respond to a growing demand from small businesses for marketing and advertising specialists to create campaigns in digital media. Not all of this is great news, but the trends are working in favor of those who can fill the changing job descriptions. For journalism professors and managers of media organizations, the message is the same or similar in every country. We have to ask ourselves if we are doing everything we can to prepare the next generation of communications professionals. We need a generation of professionals with the skills to provide the high-quality information and news necessary for a healthy democracy. In a time of rapid change and shrinking resources, we need to find ways to collaborate--the media, universities, and all the organizations and institutions that provide them with financial support--to guarantee a promising future for these communicators and the audiences they serve.